It's summer when we "expose" our skin the most, and therefore when our skin deserves our best attention, protection and care. Many of us find ourselves in this time of year feeling and seeing the effects and our skin needs and looking for ideas and advice on our what our "Summer Skin Care Essentials" should include. 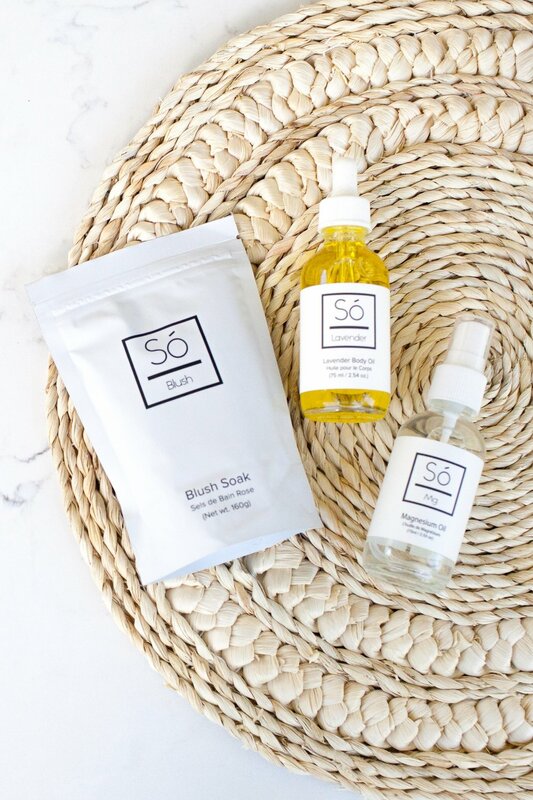 So we've rounded up some awesome products and brands, and even a service, all to be kind to the skin we are in (and expose) all summer long! Although we can honestly say we have tested, tried and enjoyed all these products and see their year round benefits. We hope our round up steps up your skin care and introduces you to some products and brands you are sure to want to add to your routine! The best part is not only have we made you learning about and getting your hands on all these amazing products, by following along you have a chance to WIN all of them! Blush Soak gently cleans and helps to eliminate dirt, impurities, dead skin and other blemish-causing debris while replenishing moisture to your (or your baby's) sensitive skin without stripping the natural oils. Offering healing benefits to dry skin, minor cuts, burns and rashes with anti-itch properties to soothe or relieve itchy or inflamed skin. Since summer also means we're wearing a little less clothing the fact that it provides anti-viral, anti-bacterial, anti-microbial and anti-fungal properties is an important added bonus. All while feeling like a relaxing epsom salts bath! Só Luxury Topical Magnesium Oil helps to reduce stress and anxiety, aids with sleep, and works to help relieve aches and pains and even migraines! It's combination of genuine moonstones and ylang ylang oil soothes, calms and aids in clearing the mind and senses, while lavender oil does it's job to ease anxieties, tension and promote restful sleep. This oil has become part of my nightly routine! Body Oil is a summer must-have for us! This wildly popular oil is packed with the moisturizing and nourishing blend of Jojoba, Apricot and Avocado oils with a touch of Vitamin E developed to be used in place of body butter or moisturizer, and also provides a dewy glow! Click HERE to shop Só Luxury online or find stockists! Goddess Grains Facial Cleanser is a daily face polisher filled with water-activated ingredients that refine your skin's texture. Key botanicals are included to stimulate cell turnover and increase blood flow leaving you with a smooth and healthy glow. With it's amazing list of ingredients and their individual and collective benefits, it's no surprise that most faces experience an improved look and feel on the first wash. We can honestly say our skin felt great and looked polished! Fennel seeds speed up skin circulation so the nutritious benefits of the other ingredients are absorbed easily. Rice balances skin tone and as an anti-inflammatory. The oat soothes inflammation and feeds your skin nutrients. Rose powder is an antioxidant; to heal, nourish and repair. The two seaweeds provide skin food, to improve blood circulation and cell turnover. Calendula is a skin soother for inflammation or any other aggravated pores. And of course the Vitamin C is anti-aging, toning, skin balancing and helpful with skin pigmentation. Click HERE to find stockists! Replace your face moisturizer with this and watch your skin glow! This Face Serum is rejuvenating, reduces inflammation, diminishes fine lines, and helps produce new skin cells and elasticity while cleaning pores. It includes rich nutrients and healthy fats to help restore collagen, moisturize, and to tighten facial skin. Thick moisturizers clog your pores with heavy waxes, forming a barrier on your skin, and strip your skin of its natural oils. This serum absorbs all of it's active ingredients quickly and deeply instead of lying on your skin surface like a moisturizer. Great for sensitive skin as it cleans clogged pores and removes any dirt, blackheads, whiteheads or irritants. Apply after you wash your face in the evening and in the morning, allowing it to work on your skin all night and day. Another one of our SeaLuxe favorites! Rose Nectar is such a versatile product it's one of those must have in your purse items. Rose Nectar is a skin hydrator, helps with skin redness and sensitivities, relieves tired eyes and can be used to set make up. And it's so refreshing, especially on hot summer days! Containing only five ingredients: water, roses, kelp, probiotics and glycerinspray is a fantastic example of how SeaLuxe sources the best ingredients that nature has to offer, each chosen with a purpose and a conscience. A summer must-have! The best Ingrown Hair Eliminator and Skin Exfoliant you'll ever use. Seriously. It's not a "pretty" subject, but for many ingrown hairs, bumpy or rough skin is a real challenge and a part of summer skin care struggles. Serious Serum was developed by the people at Urban Waxx who know all about waxing and achieving your best smooth summer (and year round) skin! Their combination of facial grade AHA/BHAs, green tea, aloe vera, chamomile, coconut, willow bark, chia, glycolic and lactic acids when used post waxing is designed to alleviate ingrown hairs, soothe skin and minimize redness. Serious Serum will leave your skin silky smooth and fabulous anywhere you apply it. A must have product in your best skin arsenal! Say goodbye to dark circles and puffy eyes! This Coffee Eye Serum is an infused oil that lightens under-eye circles while removing puffiness. Coffee works wonders for our skin. The caffeine helps tighten fine lines (like the ones around our delicate eye area), and reduces puffiness by preventing blood flow to the area. The stimulating properties of coffee also brightens your skin.. Combined with super-oil rosehip, vitamin E oil and scented with luxurious neroli essential oil which helps regenerate skill cells and improves the skin's elasticity. Gently roll under your eyes before bed and in the morning after washing your face. Our glass vial includes a metal roller ball for a cooling application that further reduces puffiness. Osprey Village Soap Company never uses fillers or unnecessary additives so a little goes a long ways! These buffers really do have proprietary infusion technology, lasting shower after shower. The surface changes as you squeeze, from a gentle exfoliating texture to a smooth surface, cleansing, moisturizing and rejuvenating your skin from head to toe! There are several refreshing fragrances to choose from, all containing extracts of Yuzu, Edelweiss, & Vetiver. These buffers not only leave you clean and smooth, but also smelling amazing. They are an all in one body beauty treatment to use as part of your every day routine at home, and are easy to travel with, the perfect way to start your skins day, rejuvenate it after a day at the beach, or both! Hydraplaning is a treatment exclusive to and developed by Lift Skin Health & Laser. It combines exfoliating and peach de-fuzzing with the added benefits of their nourishing Hydrafacial treatment. This treatment sloughs off any extra dead skin build up, performs extractions and infuses your new skin cells with deeply hydrating active ingredients. Leaving your skin hydrated, your every day skin care products will penetrate better and your makeup will go on more smoothly and will stay in place. Hydraplaning immediately diminishes the look of dry fine lines, improves skin texture, cleans pores, removes fine and course facial hair, speeds up healthy new cell production, helps smooth acne scarring, removes surface pigmentation and helps remove and prevent pre-cancerous cells from forming. All of this with minimal downtime and possible mild redness which diminishes quickly. Unlike many other skin treatments Hydraplaning can be done with an active tan, allowing it to be part of your skin care routine year round! Your skin will look and feel hydrated and dewy, perfect for your best make-up free beach and summer days! Fresh wipes are another NEW product from the people at Urban Waxx developed to keep us... fresh! Ph balanced and entirely free of parabens, dyes, petrochemicals, sulfates and synthetic fragrances, fresh wipes are gentle enough for all areas! These lightly scented with essential oils wipes are available in rose water, cucumber, coconut and lavender and are individually packaged for convenient use anytime you want on the spot freshening. They are a must have for your purse, perfect for your gym or yoga bag, camping or any time you want to feel your freshest or any "appointment" you may want to show up your freshest for. We are loving these little packages with big freshness! Available at all Urban Waxx locations, and on freshwipes.com! Remember to ENTER TO WIN all these products on our Instagram Giveaway!